Prof. Steve Dentel discusses his work. 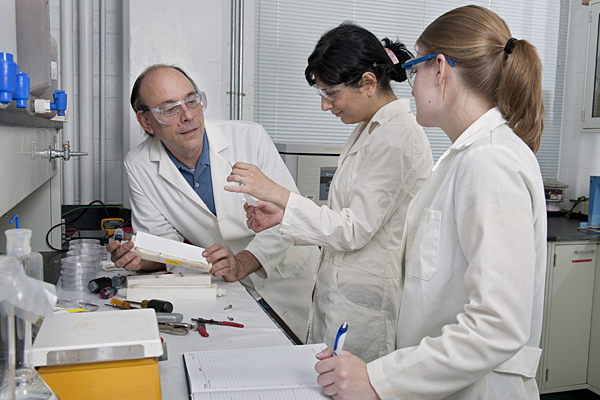 Prof. Steve Dentel of the Department of Civil and Environmental Engineering (left) and two of his students Solmaz Marzooghi (center), a graduate student, and Tracie Ervin (right), an undergraduate, working in a DuPont Hall laboratory. Dentel was recently recognized by the Gates Foundation for his work on water filtration. 12 p.m., Nov. 7, 2011--Steve Dentel unfurls a large piece of muted green fabric resembling a tablecloth. “You could use this to line your outhouse pit,” the University of Delaware professor of civil and environmental engineering announces. This offbeat potential application is not the first that pops to mind. But, in the developing world, it could be a potential lifesaver. In countries where sanitation remains antiquated, for instance, a pit in the ground serving as a latrine, pathogens, germs and parasites from human waste easily make their ways into drinking water. Dentel believes the fabric, a breathable textile that allows water vapor to escape through it, could be the answer. The Bill and Melinda Gates Foundation concurs. The nonprofit organization just named Dentel as a recipient of $100,000 in grant money from its Grand Challenges Explorations Fund. The fund targets projects that show promise in tackling global health issues where solutions do not yet exist. In experiments, Dentel and undergraduate researcher Tracie Ervin placed waste matter in two pouches. One was made of simple plastic, the other was made of special fabric, similar to that used in waterproof breathable clothing, such as raincoats. The breathable fabric allowed only vapor to pass through; the waste and its accompanying harmful organisms stayed contained. The dried remains become an inhospitable environment for germs, thus rendering the waste much less dangerous. The water escapes into the air or is absorbed back into the ground. In Dentel’s tests it is entirely pure. This low-tech solution’s applications span various environments. Dentel envisions its use in various distinct scenarios. In rural areas, it would line outhouses and latrines so their contaminants do not seep into wells or groundwater. In areas with high water tables or where houses are built above the water, the material could keep contaminants out of crops, like rice. And, in urban areas where facilities are often overused and workers must collect the waste, it would protect the workers and those living in the vicinity.